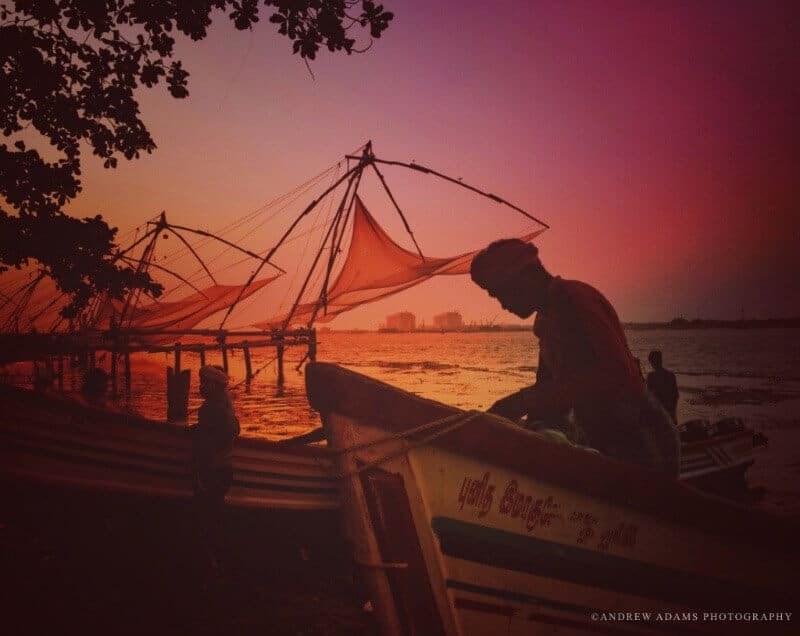 The ancient Chinese fishing nets of Kerala, India, through the lens of photographer Andrew Adams. If you want to help Kerala, India rebuild after flooding wreaked havoc throughout the state in August 2018, here’s what you need to know. Kerala is a beautiful state in South India that runs along the Arabian Sea coast to almost the very bottom of the country. Often referred to as “God’s Own Country,” it’s one of the premier tourist destinations in India — known for gorgeous tropical beaches, fascinating Backwaters, lush spice gardens, Ayurvedic treatment centres, Periyar National Park, the historic port city of Fort Cochin, and much more. I often travel in Kerala — in fact, it’s where I usually go for vacation in India. I also recommend Kerala as a great place to start your travels in India. I think of it as India’s soft landing, and wrote a blog post about Kerala with my recommendations here. The photos in both of these posts are by my good friend Andrew Adams. 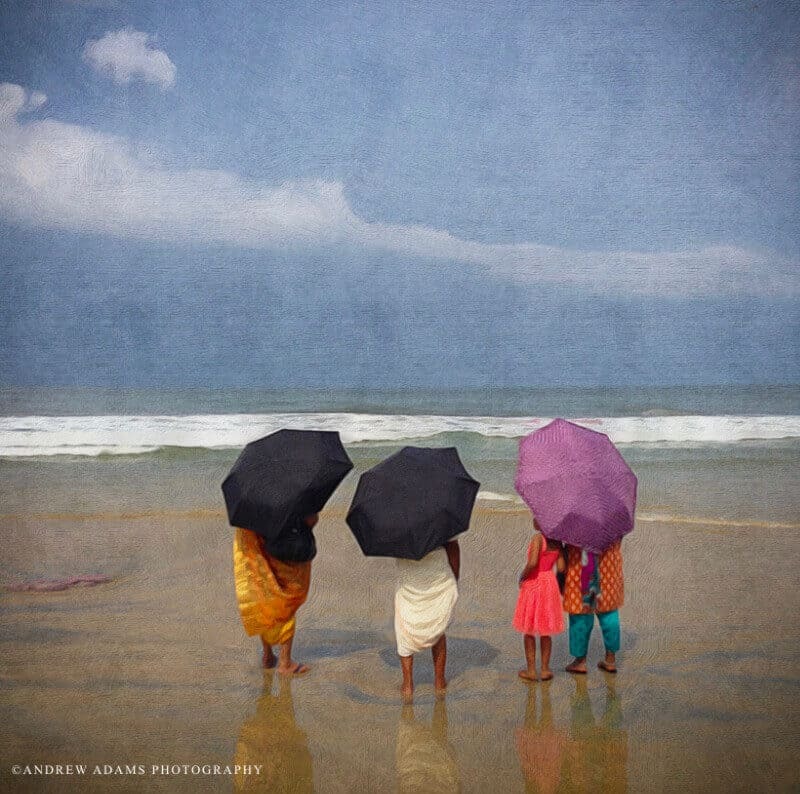 Andrew is a Canadian photographer with a passion for South Asian Culture, and he is fundraising for Kerala flood relief by selling prints of his photographs, and donating 100% of the proceeds to the Chief Minister of Kerala’s Distress Relief Fund. 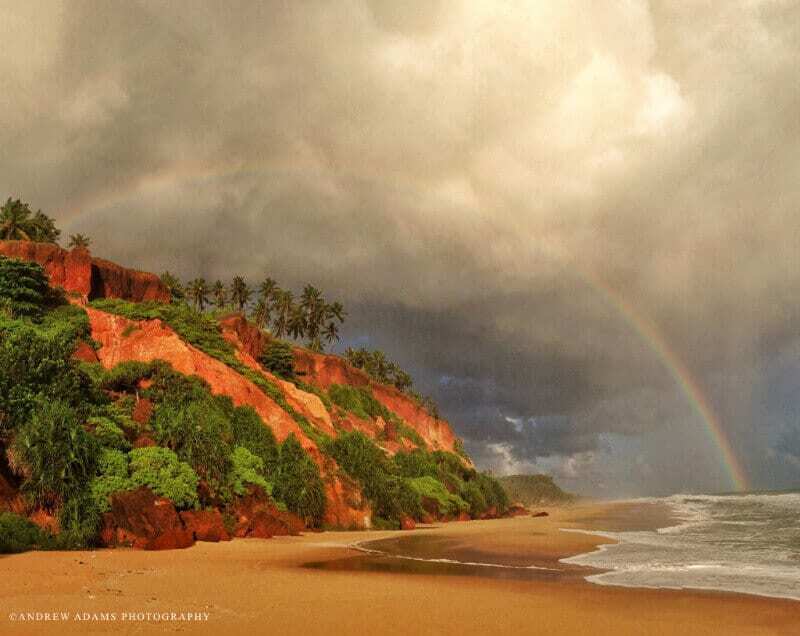 Beautiful Varkala Beach in Kerala, India, through the lens of photographer Andrew Adams. Andrew has spent the last 10 years traveling across India. 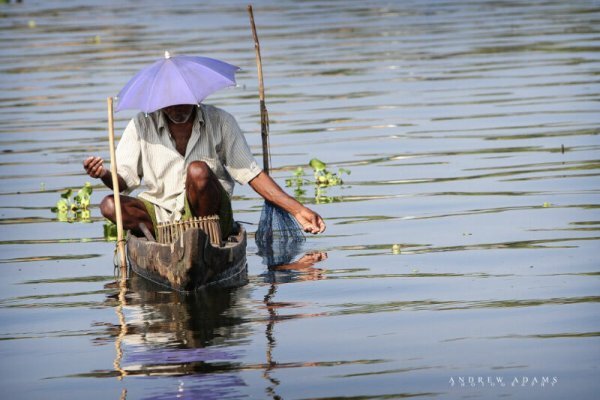 However, it is the South, specifically Kerala, that has influenced him the most, and inspired his photography. The warm, friendly people of Kerala have always welcomed him into their homes, sharing their home cooked meals, rich culture, and a simple and honest lifestyle. Andrew has spent the last few years living in Kerala and has made many friends there. When the floods hit, it shook him deeply. These are just a few of the stories that have touched Andrew personally — many are much worse — prompting him to help by selling his work and donating the proceeds to the relief fund. You can order prints, in various finishes, including canvas, framed ready to hang. Prices start at $25.00 and they can be printed and shipped to the USA, Canada, India, and also internationally. The company fulfilling the order charges a small fee (5% of sales) and printing fees. The rest will be donated to the Chief Minister of Kerala’s Distress Relief Fund. Please click here to visit the Photo Gallery and purchase a print. Follow Andrew Adams on Instagram. 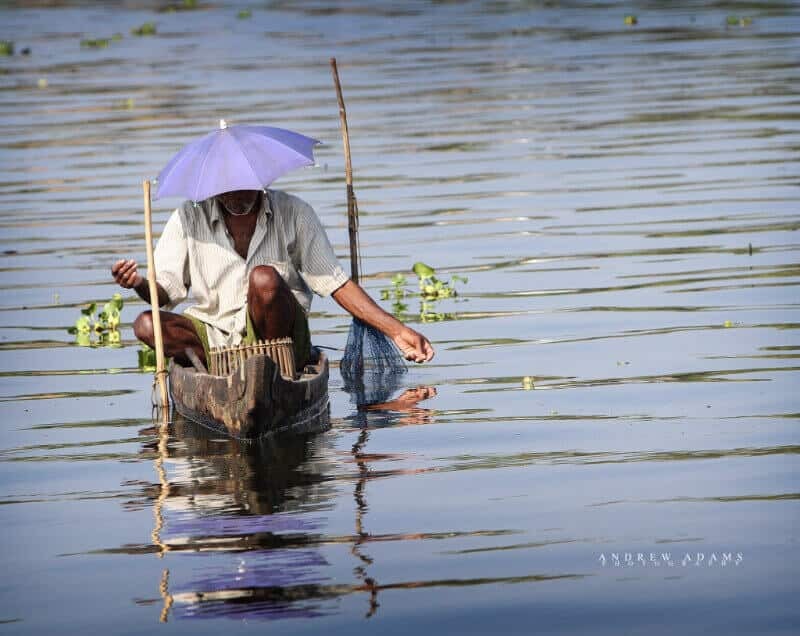 Fishing boat in Kerala, India. Photo credit: Andrew Adams. For those of you who have also been deeply touched by this disaster, and want to help, Gopinath Parayil of The Blue Yonder, a responsible travel company based in Kerala, wrote these wise words, which he has generously allowed me to reuse. 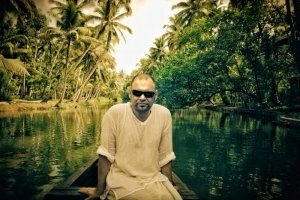 Few people have done more than Gopi to showcase and preserve the culture of Kerala, his birthplace, through his unique and compelling tours. Because you want to help and support us, please don’t pack your bags and come to Kerala to help us NOW. Please check on people you know here about what help they need before you make a move. This is NOT because we are arrogant and because we don’t need your help. WE NEED YOUR HELP. Not only for now but also for the future. Please check on us before you start your journey to Kerala. Your good intentions otherwise will clog our already broken roads, crowd our relief camps, and most importantly take away precious time from those in the ground. We don’t want unsupervised volunteering to be the next DISASTER. Irrespective of your good intentions, allow us locals to handle this crisis. We won’t let you down. We won’t let us down. We can’t afford to. The immediate crisis is over. We stood together, we held each other, we held out our hands to support one another. We know we are in your prayers. Thank you. As for the next phase, while many of us are still in relief camps, some of us have started checking on our houses. It breaks our hearts, after a week of deluge. But we aren’t broken. We know you will not allow us to break. We trust in you as well. We NEED you to hold the ground and be patient. While our fishermen rest a bit and repair their boats and nets, while our policewomen rest a little bit, us locals — ranging from drivers to merchants to technologists to politicians to housewives to officers and managers and labourers — we need to figure out HOW to fix our problems. In the meantime, please HELP US REMOTELY, unless otherwise specifically requested for. Offer to help if you have expertise. Goodwill is one thing. We respect you and appreciate even the thought of helping us. BUT what we need now is expertise. Are you an expert in disaster recovery? Then please come, but again, only when we request. Come only when we switch on the GREEN light. Until then it should be RED & YELLOW. Come visit us once our tourism season kick starts. Your spending as tourists will help us recover our 28,000 crores tourism business that provides jobs to millions of people. Help us rebuild the local economy together. We have some scars here and there. TRUE. But we are still beautiful. Inside out. We are cleaning up our roads and homestays and hotels. We will be ready for business soon. Come and holiday with us in a month. We will OPEN our homes, our HEARTS. We will welcome you with with our open arms. To show our world, our resilience, about how we stood together. Until then, please, we request you to be our standby army. Think about the rules of traffic lights. Apply the principle. History will thank you for being smart and practical and not emotional at this time. There are many, many organizations, companies, governments, and individuals who have created relief drives for Kerala. I will try and add as many credible and authorized fundraising initiatives as I can here, and will continue to add to this list. World Vision is distributing emergency relief and has a list of much-needed items you can buy and donate.